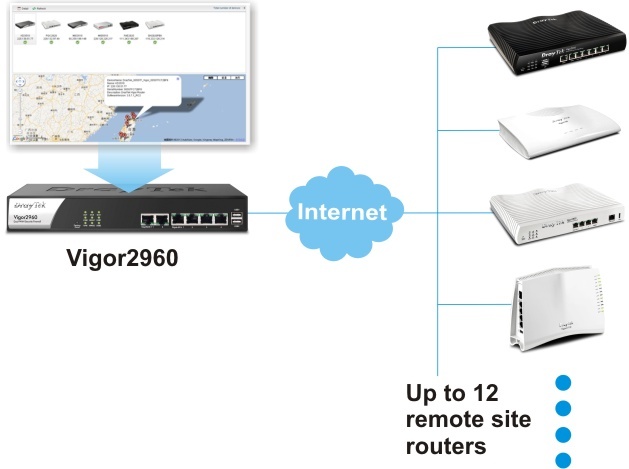 Allow your local network to access Internet using multiple Internet connections with high-level of Internet connectivity availability. PPTP, IPsec, L2TP, L2TP over IPsec. 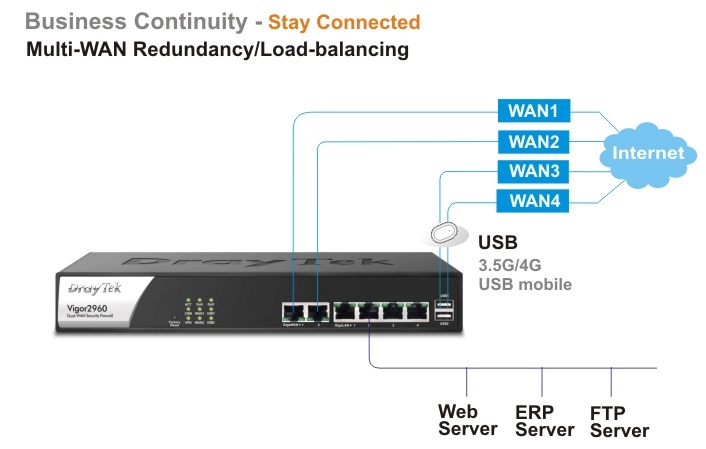 LAN to LAN, remote access (teleworker-to-LAN), dial-in or dial-out. 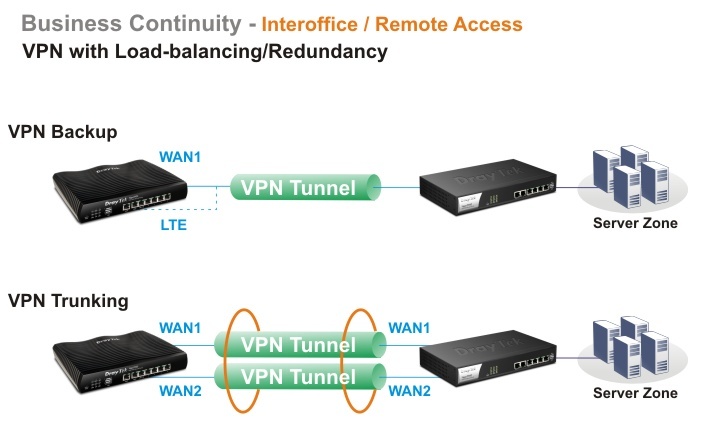 VPN load-balancing and VPN backup. Lightweight directory access protocol. The enterprises use LDAP/Active Directory authentication technology to allow administrator, IT personnel and users to be authenticated when trying to access company's intranet environment. VPN over routes without VPN pass-through. Pre-shared key; IKE phase1 aggressive/standard modes & phase 2 selectable lifetimes. Authentication for PPTP remote dial-in. Because DrayTek add a virtual NIC on the PC, thus, while connecting to the server via IPSec tunnel, PC will obtain an IP address from the remote side through DHCP protocol, which is quite similar with PPTP. When there is traffic between the peers, it is not necessary for one peer to send a keep-alive to check for liveness of the peer because the IPSec traffic serves as implicit proof of the availability of the peer. Provided free of charge for teleworker convenience (Windows 7/XP including 32/64 bit). No additional client or remote site licensing required. 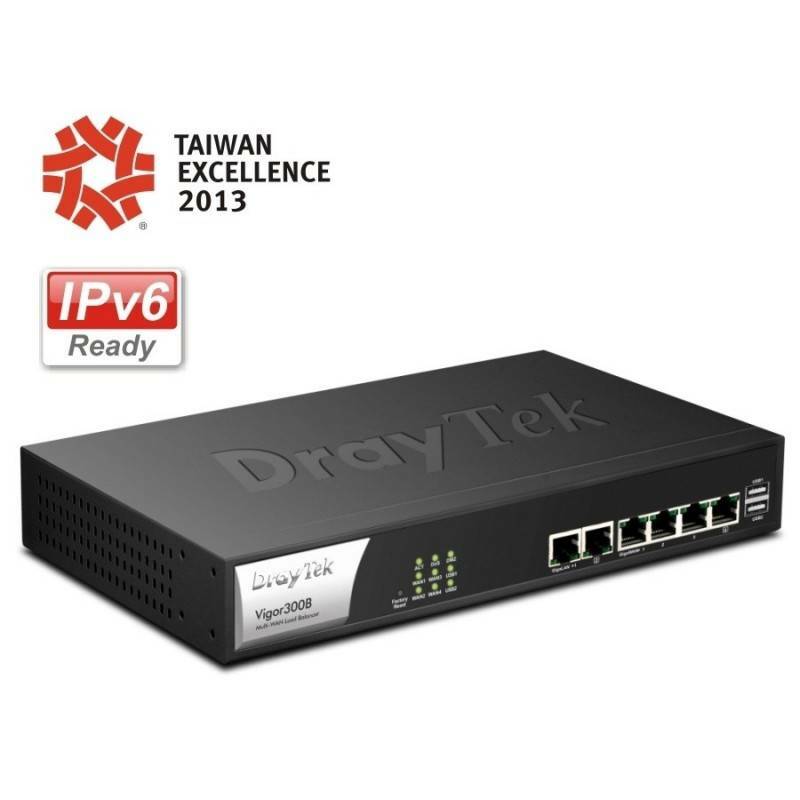 Compatible with other leading 3rd party vendor VPN devices. CVM, central VPN management, manages VPN tunnels easily. Set rule according to your specific office hours. Outgoing/Incoming traffic inspection based on connection information. You have been allocated multiple public IP address by your ISP. You hence can have a one-to-one relationship between a public IP address and an internal/private IP address. This means that you have the protection of NAT (see earlier) but the PC can be addressed directly from the outside world by its aliased public IP address, but still by only opening specific ports to it (for example TCP port 80 for an http/web server). The packet is forwarded to a specific local PC if the port number matches with the defined port number. You can also translate the external port to another port locally. As port redirection (above) but allows you to define a range of ports. -This opens up a single PC completely. All incoming packets will be forwarded onto the PC with the local IP address you set. The only exceptions are packets received in response to outgoing requests from other local PCs or incoming packets which match rules in the other two methods. The header information of an IP packet (IP or Mac source/destination addresses; source /destination ports; DiffServ attribute; direction dependent, bandwidth dependent, remote-site dependent. Act of preventing customers, users, clients or other computers from accessing data on a computer. Source IP address check on all interfaces only IP addresses classified within the defined IP networks are allowed. E-mail alert and logging via syslog. Flexible DHCP with 'IP-MAC binding'. Let administrator adjust time zone and promptly set up the Internet (PPPoE, PPTP, Static IP, DHCP). Remotely administer computers via the telnet. 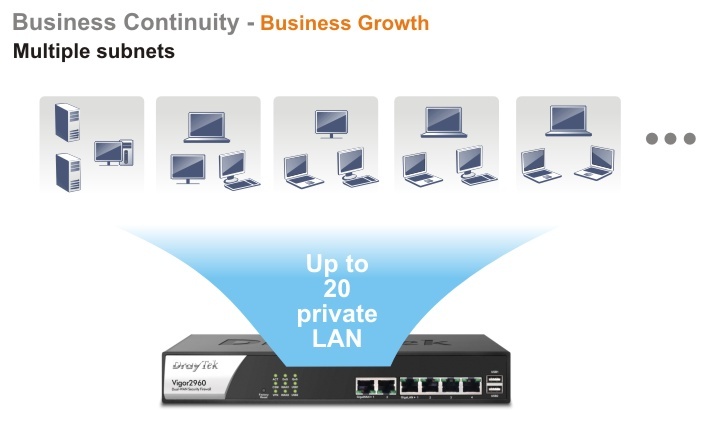 Provides an easy-to configure function for your local IP network. When you connect to your ISP, by broadband or ISDN you are normally allocated an dynamic IP address. i.e. the public IP address your router is allocated changes each time you connect to the ISP. If you want to run a local server, remote users cannot predict your current IP address to find you. The password can be applied to authentication of administrators. If the hardware breaks down, you can recover the failed system within an acceptable time. Through TFTP, the effective way is to backup and restore configuration between remote hosts. Create separate groups of users via segmenting each of the Ethernet ports. Hence, they can or can't communicate with users in other segments, as required. Dial-out trigger, routing table, ARP cache table, DHCP table, NAT sessions table, data flow monitor, traffic graph, ping diagnosis, trace route. The Vigor has a real time clock which can update itself from your browser manually or more conveniently automatically from an Internet time server (NTP). This enables you to schedule the router to dial-out to the Internet at a preset time, or restrict Internet access to certain hours. A schedule can also be applied to LAN-to-LAN profiles (VPN or direct dial) or some of the content filtering options. By means of using a VLAN ID, a tag-based VLAN can identify VLAN group membership. The VLAN ID provides the information required to process the traffic across a network.Furthermore, the VLAN ID associates traffic with a specific VLAN group. Using the TFTP server and the firmware upgrade utility software, you may easily upgrade to the latest firmware whenever enhanced features are added. Dial-in access management (PPTP/L2TP and mOTP) and LDAP/Active Directory integration. With Telnet/SSL, SSH (with password or public key), browser (HTTP/HTTPS), TFTP or SNMP, firmware upgrade via HTTP or TFTP. A PC on LAN can be woken up from an idle/stand by state by the router it connects when it receives a special 'wake up' packet on its Ethernet interface. Syslog is a method of logging router activity. SNMP management via SNMP v1/v2, MIB II. Reserve minimum and maximum bandwidths by connection based or total data through send/ receive directions. Priority queuing of packets based on DiffServ. Define session /bandwidth limitation based on IP address. Complete independent management and configuration of IP networks in the device, i.e. individual settings for DHCP, DNS, firewall, VLAN, routing, QoS etc. NTP client, automatic adjustment for daylight-saving time. Based on firewall rules, certain data types are marked for specific routing, e.g. to particular remote sites or lines. It is with routing protocol of RIP v2/OSPFv2/V3*. Learning and propagating routes. An instruction to re-route particular traffic through to another local gateway, instead of sending it onto the Internet with the rest of the traffic. A static route is just like a 'diversion sign' on a road. Free firmware upgrade from Internet.